Investing in business automation helps you with less redundant workflow and increases the efficiency in customer facing process. It saves a lot of operational costs as well as time. Business Automation Software aims a cost-efficient and error-free solution for your business. Having a business automation software will help you to recognize and eliminate repetitive business processes. If you are planning to develop a business automation software from a reliable service provider in your budget, you may connect with the experts at TechSupportDubai. 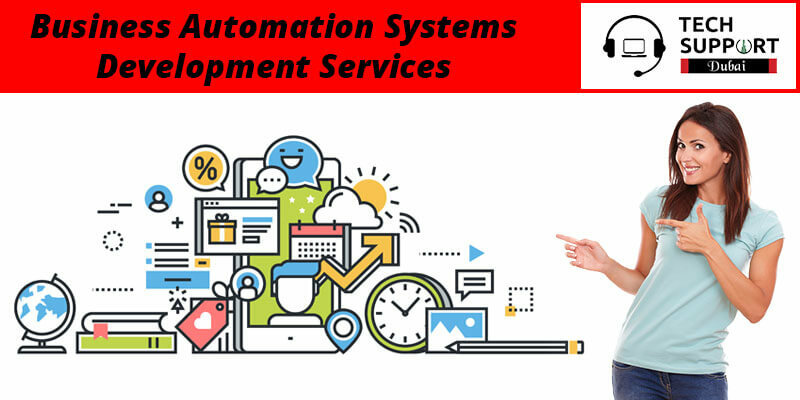 Our team consists of well-trained experts who can offer you business automation systems development services at an affordable price. Streamline Automation: An automated streamline enables the team to perform a work in a secure and streamlined way. It can also help you to visualize all the requests at one go. Transparency: Approvals and rejections are bound to occur when you perform a specific task. By enabling the openness, it helps you to upgrade the accountability of your business. Applying automation will help you to recognize the longer as well as the shorter tasks so that you can perform it within an allotted time. Cost Minimization: Basically, by replacing the human efforts with the accuracy of a machine, you can deduct the extra cost spend on manual efforts. Late payment, slow sale, etc.are all costly errors. Business Automation development can help you reduce such mistakes and save a lot of labor cost. Having a Business Automation Software will help you with great business deals, but you should be careful about choosing the right service provider for this software. End to end workflow mapping. We identify the needs to enhance your workflow. Our team at TechSupportDubai creates the blueprints and designs to enhance the workflow of your business. We manage as well as deploy the onsite projects for your work. We use proven and current best technologies to enhance your business infrastructure. As the leading Business automation software development company, we provide services at a minimal cost. You can directly call the experts at Tech Support Dubai and allow them to will provide you with the best Business Automation Systems Development software at an affordable cost. You can also chat with our experts on our live chat portals. You can comment on different processes to create a software. We also have an official email id where you can send your service request. Connect with us and enjoy the advantages of a perfect business automation software. We also provide template design service in Dubai.